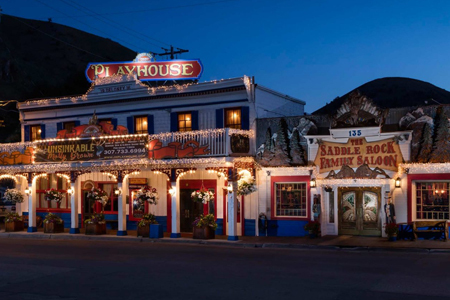 The historic Jackson Hole Playhouse brings you a full evening of Western entertainment, from gun-slingin’ singing waiters to fully-staged musical comedies. You can kick off your boots and enjoy true Western hospitality at Wyoming’s longest running professional dinner theatre. This summer’s production is “The Ballad of Cat Ballou”. Price is $75.00 for adults, $60.00 for youth (13-17) and $50.00 for children (5-12). Price includes 3 course meal and ticket to the show. Dinner is served promptly at 6:30 pm with the show starting around 8 p.m. Open daily except Sunday. Alcohol, tax and server gratuity are not included in the price. You can do VIP tickets which guarantee front row seating for the show, complimentary popcorn and beverage during the performance. VIP ticket prices are $95.00 adults, $80.00 youth (13-17) and $70.00 for children (5-12). All tours have a 48 hour cancellation policy (unless otherwise noted) and are subject to a 20% cancellation fee. Call or click now and one of our local concierges will promptly respond. Let us know your dates of travel and the activities you're interested in and we'll get started putting together your dream vacation! Call or email us and one of our local concierges will promptly respond. Let us know your dates of travel and the activities you’re interested in and we’ll get started putting together your dream vacation! We care about our guests and strive to make your experience here in Jackson the best ever!